I wrote this EnScript years ago and recently had a need to use it on some evidence. I realized I had not posted this before on the blog so I figured I would post it in case others had a similar need. 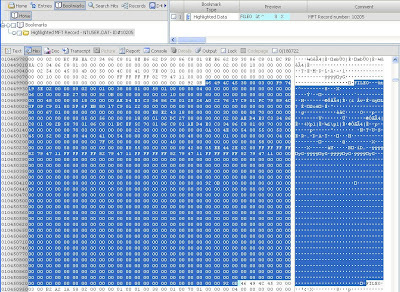 You can then quickly inspect the actual raw MFT record to decode it manually or view any residual slack data, etc..
>>> But there are times when I want to look a the second set of timestamps to see if the file's timestamps have been altered or to help establish whether a file was copied or moved onto the media. Can you please expound on how you would use the second set of timestamps to help establish wheter a file was copied or moved to external storage media? How do I install the EnPack? Copy the .EnPack file into the \EnCase6\EnScript folder, start EnCase. Hi lance, I done that but got this message when I try to run it "The version number does not match the header". Does it mean the EnPack does not match me EnCase version? Oh, that's explain everything. I'm on v5. Thanks! Anything I can do to convert it to be usable in v5? The other day I noticed that Encase has a similar script under the Examples tab. Its labeled "Highlight Specific MFT Record". Is there any way to use this scripts in version 5?